After 50 years of working, she deserves this. After working for pretty much her entire life, a roughly 50-year-old elephant had no reason to believe anything would change. Gaew Ta, also known as Darling, worked in the logging industry in southern Thailand before retiring to do more work: giving rides to tourists in Phuket. Slowly, over the years, Darling went totally blind. So when people arrived to take Darling away, she couldn't even see who they were. 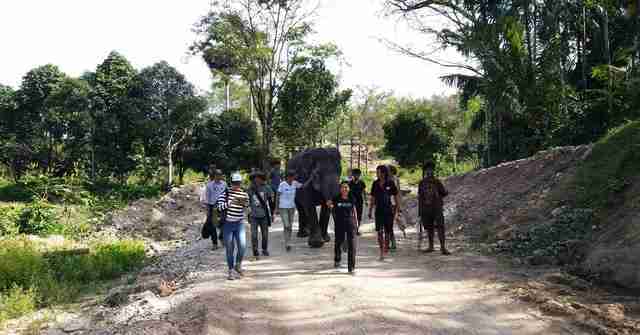 The camp had been trying to sell Darling to another elephant riding camp, until Lek Chailert, founder of Elephant Nature Park and famed elephant rescuer, negotiated with the camp. 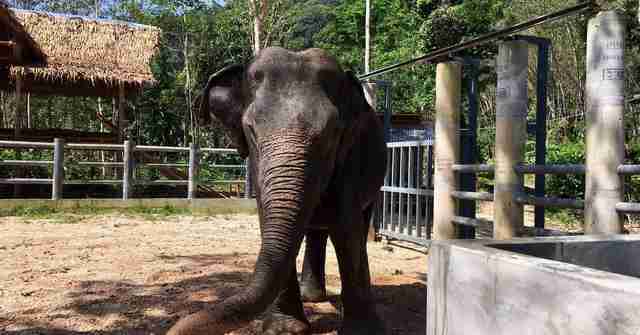 People from a new elephant sanctuary, the Phuket Elephant Sanctuary, which Chailert helped set up, were desperate to give Darling a relaxing retirement - a life she so desperately needed. When rescuers arrived, Darling didn't even hesitate to get on the truck that would take her far away from the riding camp. "When I saw Gaew Ta walk onto the truck very easily I was very surprised," Lek Chailert told The Dodo in a statement. 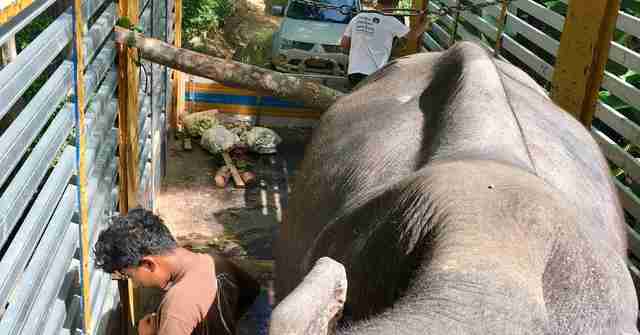 "Normally we found the most difficult part of rescue elephant is to walk them to the truck." Sadly, it turned out that Darling was used to being trucked around: She was transported to a local restaurant each evening to greet the diners there. 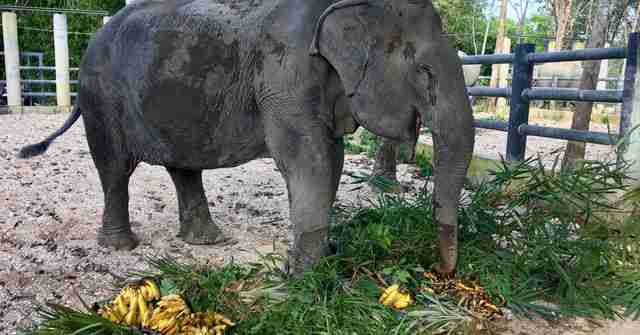 But the rescuers from Phuket Elephant Sanctuary hoped that Darling had a sense that this time would be different. Her rescuers surrounded her on the hour-long journey to her new home, helping to keep her calm. When she finally arrived, her previous trainer helped lead her off the truck and into a stream where her feet could feel the cool water. It was probably the first time in many years that Darling had felt such a sensation. 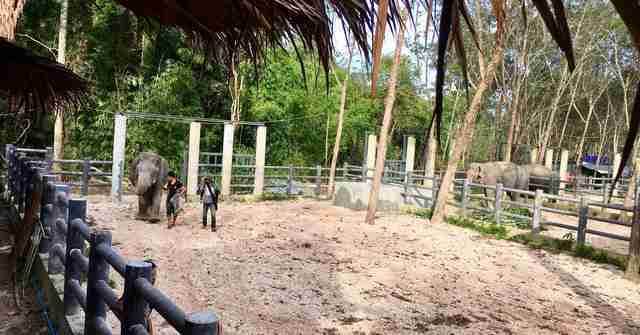 "She roamed for a couple of hours then we walked her to her night shelter," Louise Rogerson, project director of Phuket Elephant Sanctuary, told The Dodo. 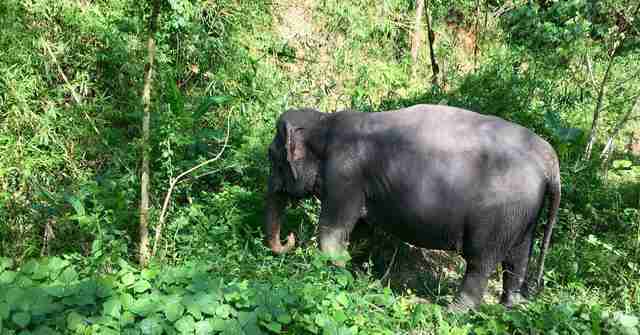 People watched as Darling explored the lush forest, using her trunk to feel around her new home. She was welcomed to her new shelter, where people gave her bushels of bananas. "She needs to slowly find her way around the sanctuary then we will introduce her to the other elephants. However, I'm sure they've all been talking as she's next to Kannika and Madee in the night shelters," Rogerson said. "The process of introduction will be slow and careful as it's a new world to her," Rogerson said. But it already looks like her new home is the best thing that's happened to Darling in a very long time. To donate to the care of the rescued elephants at Phuket Elephant Sanctuary, click here.